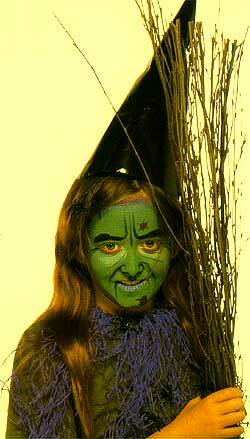 A wonderful combination of face paint, costume and ideas to dress up as the Halloween witch right at your home. 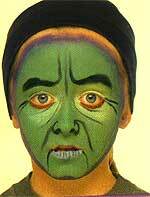 So rake up the Halloween parties, display the best trick at your trick or treat, and win the face dress this year. All cheers to this Halloween. Thick and fine brushes. The halloween witch hat compliments this costume. 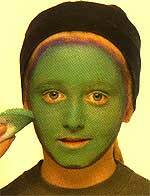 Tie the hair back, use the triangular sponge to make a purple outline around the face. 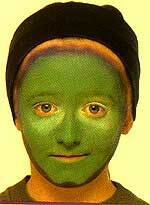 Fill the outline with green face paint using the round sponge. Blend the colors with the round sponge. 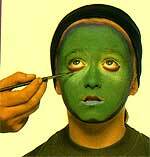 Before the green face paint dries, use the medium brush to paint above and below the eyes with white face paint. Mix white and blue face paint to make light blue. Paint the lower lip light blue using the medium brush. Lookup toward the ceiling & keep your head still while a red line is painted under both eyes. Paint black bushy eyebrows & wrinkles. Paint creases on the lips. Since witches rarely smiles, they have deep frown lines. 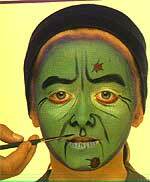 Use the tip of the fine brush to paint red circles on the chin and forehead. Clean the fine brush before outlining the circles in black. Keep using the fine brush to paint black hairs sprouting from the wars. 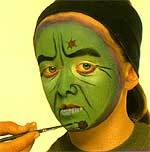 Use the fine brush and black paint to accentuate the lines under the nose and add other gruesome features. Don't forget to make a broom by tying a lot of twigs and small branches together.